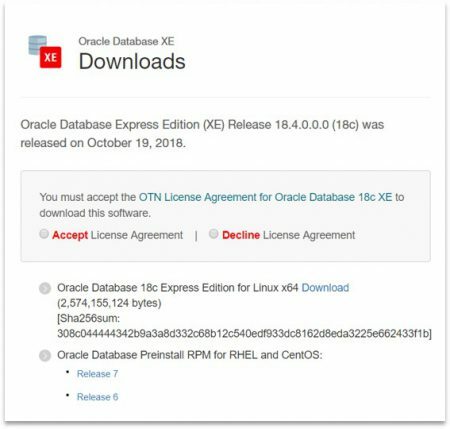 Oracle XE has many features and options which even most of the Oracle Enterprise Edition customers do not have access to (see Oracle 18 XE is available). In this blog I will go into the details about the installation and configuration. It has never been easier to install the Oracle database software. One single package with approx. 2,5 GByte in size is sufficient (Oracle eventually decided not to add an outdated version of SQL Developer and APEX to the download). In addition to the software package a preinstall package has to be downloaded. Without that one and without internet access the installation will not work. BTW: what about SuSE Linux customers? After downloading the software it can be installed using “yum”. All tasks including software installation and database configuration must be executed as root user. Whoever is familiar with Docker knows the ongoing discussion about privileges and security aspects. I won’t comment on that. The software will always be installed in /opt/oracle/product/18c/dbhomeXE (ORACLE_HOME) with ORACLE_BASE=/opt/oracle. During the installation the OS user oracle will be created with ID 54321 and all the OS groups (oinstall, dba, oper, backupdba, dgdba, kmdba, racdba) as well. If you want to keep your own ID’s you need to create those users and groups manually before you start the installation. Unfortunately the home directory for oracle is missing. #It is used when running '/etc/init.d/oracle-xe-18c configure'. [FATAL] [DBT-06103] The port (5,500) is already in use. ACTION: Specify a free port. Database configuration failed. Check logs under '/opt/oracle/cfgtoollogs/dbca'. The error message is misleading. It’s not the port but the missing hostname. So add the correct one in /etc/hosts. With this change the database configuration task should work without any problems. Look at the log file "/opt/oracle/cfgtoollogs/dbca/XE/XE.log" for further details. Also the commands for the deletion of the database and deinstallation of the software are available – even though you don’t want to deinstall anything. It’s fun! An Oracle database with Enterprise Edition Features and many interesting options free of charge! In my next blog I will go over some examples with the Multitenant Database Option in XE. BTW: you can configure the XE database with dbca as well. This gives some more opportunities and challenges. I’m going to write a blog about that topic as well..